Black beans, botanically-known as Phaseolus vulgaris, are native to the Americas. 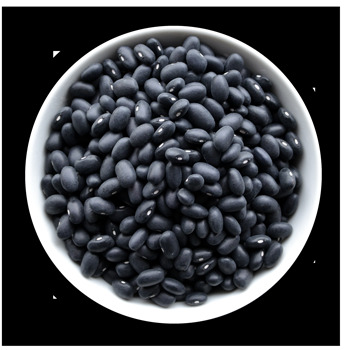 One of over 500 varieties of kidney beans, black beans are also known as turtle beans, caviar criollo, and frijoles negros. not eaten fresh. The beans must be soaked, reconstituted, and cooked before eating. buy only as much as you will use in a month. Packaged dried beans should contain no broken beans and should be in tightly-sealed packages. Also avoid any shriveled or broken beans. Dried black beans should be stored in a sealed container in a cool, dry place up to 1 year. When re-stocking, do not mix new beans with any remaining older dried beans. They will cook at different rates. Older beans will take longer to cook. In Brazil, a country that, along with India, grows more black beans than any country in the world— beans have been given an exclusive place on the Brazilian Food Pyramid. In other words, beans are recommended as their own unique food group! dried beans in most recipes. Just skip the bean cooking part of the recipe. You may wish to drain and rinse canned beans before using. they could take 2 hours or longer to cook. cook in less time. Pre-soaking black beans overnight will significantly reduce cooking time. Cover with 2 inches of water and allow for expansion in the container. Drain and cover with fresh water before cooking. If your kitchen is particularly hot, refrigerate the black beans while they soak to prevent fermentation.